Hollywood Undead is an American rap rock band from Los Angeles, California. They released their debut album, Swan Songs, on September 2, 2008, and their live CD/DVD Desperate Measures, on November 10, 2009. 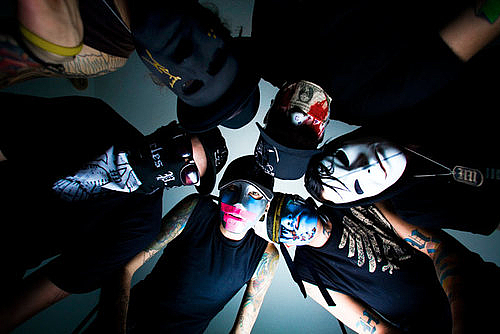 The band consists of Tha Producer, Charlie Scene, Da Kurlzz, Funny Man, J-Dog, and Johnny 3 Tears. The band members use pseudonyms and wear masks to display a creative side, not to hide their identities as first assumed. They peform live without the masks on. The band originated in 2005 from a song titled "The Kids" that Aron Erlichman (Deuce) and Jorel Decker (J-Dog) posted on the band's MySpace profile to positive reviews, leading them to form the group Hollywood Undead with their friends "Shady" Jeff Philips, George Ragan (Johnny 3 Tears), Jordon Terrell (Charlie Scene), Dylan Alvarez (Funny Man), and Matthew St. Claire (Da Kurlzz). In an interview with Shave magazine, J-Dog explained that when forming the band "Whoever was in the room at the time and played an instrument was in the band." The band only took one year working on their debut album, Swan Songs. The other two years were spent looking for a company that wouldn't try to censor the album. They first signed a record contract with MySpace Records in 2005 but they left the label after the label tried to censor their first album. They then signed a contract with A&M/Octone Records and their first album, Swan Songs was released on September 2, 2008 and reached #22 on the Billboard 200 in its first week of release, selling 21,000 copies; which was later on released in the United Kingdom on May 18, 2009 with two bonus tracks. On June 23, 2009, Hollywood Undead released Swan Songs B-Sides EP through iTunes. After 64 weeks, the album fell off of the Billboard Top 200, but returned four weeks later at #174. Since then, it has gone in and out of the top 200, and is currently charting at #199. On July 28, 2009, it was certified gold by the RIAA. The band released a CD/DVD set entitled Desperate Measures on November 10, 2009. The set includes a CD of previously unreleased six new songs, three of which being cover songs, as well a previously unreleased remix of "Everywhere I Go", and six live recordings of songs from Swan Songs, and a DVD of a full live performance by the band.The album debuted at #29 on the Billboard 200, #10 on Top Rock Albums, and #15 on Top Digital Albums. Subscribe to Hollywood Undead RSS Feed to get latest lyrics and news updates. What do you think about Hollywood Undead? Let us know in the comments below!